Take my mood for example. Despite the life-threatening floods, the devastation of my road, the loss of power–and phone–and internet, I’ve been generally upbeat. Then I got tired. And my mood soured. And I felt desperate–even after my power and my phone and my internet and almost my road were restored. You know why? Because it was a gorgeously, hot late summer day and I couldn’t go to South Pond. Here I have friends who have lost their homes or their businesses, and I’m depressed because they’ve closed all the swimming holes in Vermont on Labor Day Weekend. Then again, if I withheld feeling sorry for myself until everyone else in the world had it better, I’d never get my turn at self-pity. And what about joy? Should that be limited until everyone has it back too? My mood changed after my bath, and here I am writing again in my own home instead of searching for wi-fi outside of others homes and businesses. 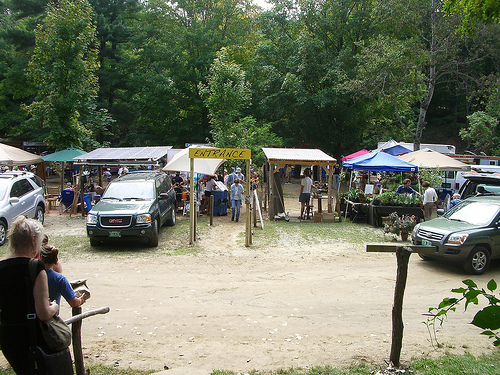 Anyway, the Brattleboro Farmers Market was washed away in the flood on Sunday, but they rebuilt it, as a community, on Thursday. At 8:00 that morning, the parking lot was already filled with volunteers and a grater at work. A friend of mine told me that just as he put out the last picnic table on the freshly seeded dirt at the end of that day, some travelers arrived in the parking lot, walked down the hill, and set themselves up with a picnic–with no idea of the miraculous efforts that preceded it. My first few trips there were unnerving, to say the least; but today’s trip had me all but forgetting that there was a murder inside–because I was so engaged in talking to others about their homes and their roads after the flood. And then there was the afternoon a week ago when a young family nursed their baby in the Cafe and another family enjoyed dinner there–unaware that we were all reeling from loss, and afraid ourselves to step inside. Things change; and that’s a good thing, even if it sometimes makes us feel forgotten or ignored or irrelevant, like the water that could care less what was supposed to be its bed and what was meant to be our roads. That first morning after the flood, I wrote about the apocalyptic change the water brought to my dirt road, and to the highway a half-mile away. Two days later, however, I returned to those forever changed places and found them relatively restored. This change was almost as mind-blowing as the first. Everything must change, nothing stays the same, go the lyrics from a song that once made me cry when I first came of age and watched everything I loved disappear. Now those lyrics comfort me, knowing that not only good things change, but bad things too. For more on Hurricane Irene & Vermont, click here. Mom, There’s a Fish in the Toilet! 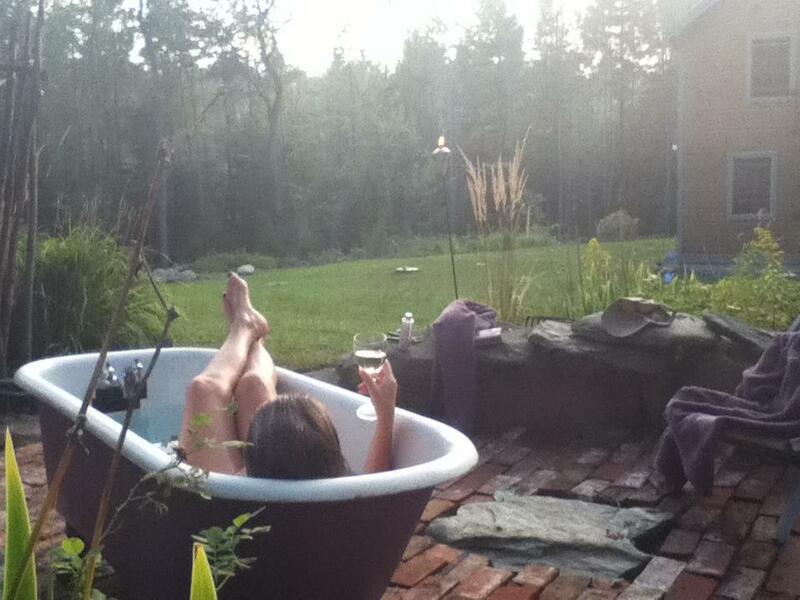 Kelly, love the bathtub photo — so perfectly Vermont. It has been a crazy, draining week for all of us. Glad to hear that you and yours survived without much damage, just inconvenience. We did the same.